Funded by UNICEF Chennai – There is a huge taboo in most Indian households, especially in the villages, to build toilets. In the rare event of one being built, the skill on how to use them, keep them clean and where and how the waste from it is treated or cleaned, is never quite understood. Even simple acts such as washing hands thoroughly has never been explained to any of us very well, and few people are aware that well washed hands can prevent diarrhea, dysentery, and a whole host of other diseases that prove fatal for many children in India, every year. UNICEF Chennai funded Nalamdana to train about 100 village volunteers (young men and women) through 2008 and 2009 in the Krishnagiri District of Tamilnadu state, on passing on key messages on hand washing, toilet use, and the safety, and advantages to building and using toilets.These trained teams performed plays in their village taluks from August through December 2009. 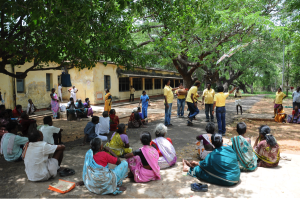 In connection with the previous theatre training and performances, UNICEF had requested Nalamdana do a short term project (September to December 2010) addressing the same WES issues focusing on the Thally block of the Krishnagiri District. Toilet humour and quirky characters acted in filmy style have the audiences laughing and cheering while they get key messages on these health issues. 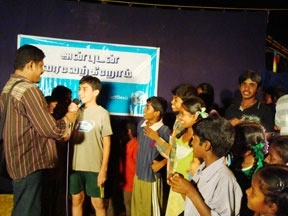 The Nalamdana team did their homework as always, to asses the practices in the area, meet with the Block Development Officers and the Cultural team members of the Krishnagiri Cultural Society at the Thally Panchayat office, and based on their findings, they planned the refresher theatre training and the 50 theatre performances. 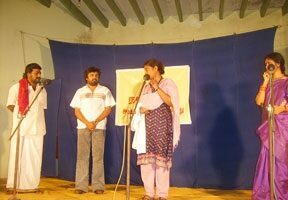 As a result, that year, these trained performers staged these plays at the 50 Pancahyat villages of the Thally block. From 20th to 23rd September 2010, Nalamdana conducted a refresher theatre training workshop for the 30 select UNICEF volunteers from Mathur, Bargur, Vepanampalli, Kelamangalam, Oothangarai, Thally and Krishnagiri blocks. were developed and practiced during the workshop. These trained volunteers were split into three groups and each group was given specific dates to perform the role play in the 50 identified villages of the 50 panchayats in the Thally block. The results of these performances were beyond anything that Nalamdana or UNICEF had hoped for. Several houses have built toilets just outside their homes, and a few people have even built the toilets attached to their houses. It is now seen as a status symbol, and those who had toilets they weren’t using, are now using them regularly! UNICEF has sourced a subsidy and at least a part funding for the construction of these toilets.